In the car on the way to Morpeth, just over two hours north of Sydney, I wasn’t really in one of my best moods. Not only had most people I cautiously consulted advised me that the Maitland region was “nothing special, you’ll see” – but predictions of typhoon-like weather had only added to my depressed state. So here we were, my partner Joel and I, belting along the Pacific Highway, expecting angry storm clouds and a weekend spent like drenched rats in a spot I’d been recommended to avoid. All I could smell was fresh, clean country air, mixed with the welcoming fragrance of woodfire smoke, emerging from the chimneys of rustic old sandstone buildings. Little did I know that quite the contrary was waiting for me at the end of the road. Leaving the F3 behind us, the countryside changed dramatically. All I could see were endless, rolling, green hills specked with quaint little cottages, which were surrounded in turn by paddocks stocked with plenty of well-fed cattle. I immediately fell in love. By the time we arrived in Morpeth, about five kilometres north of Maitland, it was completely dark, the rain had paused and temperatures had dropped to what I would almost dare to describe as Arctic. All I could smell was fresh, clean country air, mixed with the welcoming fragrance of woodfire smoke, emerging from the chimneys of rustic old sandstone buildings. After a quick and well-deserved beer (at least for Joel, since he’d driven the whole way) at the Commercial Hotel, we were welcomed by our host Martin Hurley from Bronte Guesthouse, only a stone’s throw from the pub. The pretty driveway entrance to Camyr Allyn Wines. The Bronte Guesthouse on Swan Street is tucked away behind gorgeous thick-branched willow trees and hedges. The heritage-listed B&B was built in 1860 and, as Martin told us, then housed the first business of Caleb Soul, founder of the well-known Soul and Pattinson Chemists. Before opening in 2001, the guesthouse was renovated, combining a chic and modern style with all the original and historic nooks and crannies. The six guest rooms provide all you’d expect from a four star B&B. Martin recommended we have dinner “at the bakery”, which I thought was a bit odd. I mean, since when do bakers serve dinner? Don’t they have to get up and make bread at some ridiculously early hour? I soon learned that the Historic Arnott Bakehouse is unique in that regard. Owner Stephen Arnott and his wife Allison had converted the top half of the bakery into Morpeth’s only true fine-dining restaurant. And here were Joel and I, the only guests, sitting in the very building that the Arnott family had used as a residence – and more importantly as a bakery – since the 1860s. The venue was just beautiful, decorated in warm and earthy colours, antique in style with modern furniture. Inside, two dining areas, a lounge area with adjoining balcony paired with the bakery, kitchen and famous oven on the lower levels, made for a fine-dining experience with a twist. Head chef Jose Miguel, who moved to Australia from the Philippines, had nothing but praise for Morpeth. “I’m so pleased we found this place,” he told us when he came up for a chat, after creating some of the tastiest food we’d enjoyed in a long time. Joel had a perfectly cooked rib eye and my highlight was the beetroot risotto drizzled with Bunna Bunoo olive oil, which just melted in my mouth. Accompanied by a variety of delicious entrees (ask for the rabbit terrine) and a Shiraz picked from a more than extensive wine list, our first night in Morpeth had started out perfectly. Reluctantly leaving the warm and cosy vicinity, we made our way back to the Commercial Hotel for a few more drinks and to meet some of the locals. It was here that I truly realised that there wasn’t only incredible history to be discovered in Morpeth, but also that its residents adore the town and aren’t afraid to share a laugh and a yarn with “outsiders” – which has not often been the case on my travels around Australia. One of our newly acquired friends, John from Brisbane, explained to me why he regularly returns there: “I think Morpeth’s a beautiful town that has managed to capture its old world charm – but had a retro movement to sustain itself.” And the locals did nothing but agree with this. “As a community it’s quite eclectic . . . it’s undergoing an emerging, yet not overpowering, cosmopolitan development. But for the people who live here it doesn’t change,” smirked Ben, a local, barely raising his lip from a rapidly emptying glass of beer. The next day, as the alarm buzzed early, I would have been perfectly happy to stay in bed and out of the predicted rain. But, opening the heavy curtains, I got the first surprise for the day. The rain hadn’t returned, giving us a break from the damp and cold. The sun was out; the birds were singing. And, best of all, Martin had breakfast ready to go. A freshly squeezed orange and lime juice and a selection of fresh fruit and passionfruit yoghurt did wonders and I was ready to start out on my adventure. Now bathed in the warm rays of a stunning autumn day, I could see Morpeth in all its historic and character-filled glory. Set against the backdrop of the winding Hunter River, Morpeth truly made me feel as though I’d been transported at least a century into the past. Coming around the corner was a Clydesdale drawing a cart, the sound of its enormous hoofs pounding the pavement only adding to the atmosphere and experience. Established by Lieutenant Edward Charles Close in 1821 and soon rated as the 19th largest town in the colony, Morpeth’s success relied heavily on a flourishing river trade (it was the fourth river port in Australia), which only diminished with the completion of the Sydney to Newcastle railway line and silting of the river. What remains of this successful trading history today is a vast array of majestic, colonial-style sandstone buildings, cute arts and crafts stores, boutiques, antique shops and galleries, as well as plentiful wining and dining options for every budget and taste. You can’t help but lose track of time, meandering along stone-paved streets, discovering the tastes and sights of this premier shopping and dining hub of the Hunter Valley. Some of my definite favourites were: the Morpeth Gallery, which displays an awe-inspiring painting by John McCartin, plus has its own Ginger Beer Factory; the Lolly Shop, a sweet tooth’s paradise, which not only houses some of the widest variety of candy I’ve seen, but also produces wonderful homemade fudge; and the local Morpeth wine cellar. Vigneron Graeme Levick is a funny character who’s bound to make you laugh and produces great wine. But Graeme’s trademark is his variety of moonshine, a spirit that’ll knock your socks off (especially when you enjoy it just after breakfast like I did). After a morning of exploring, it was back to the bakery for lunch. 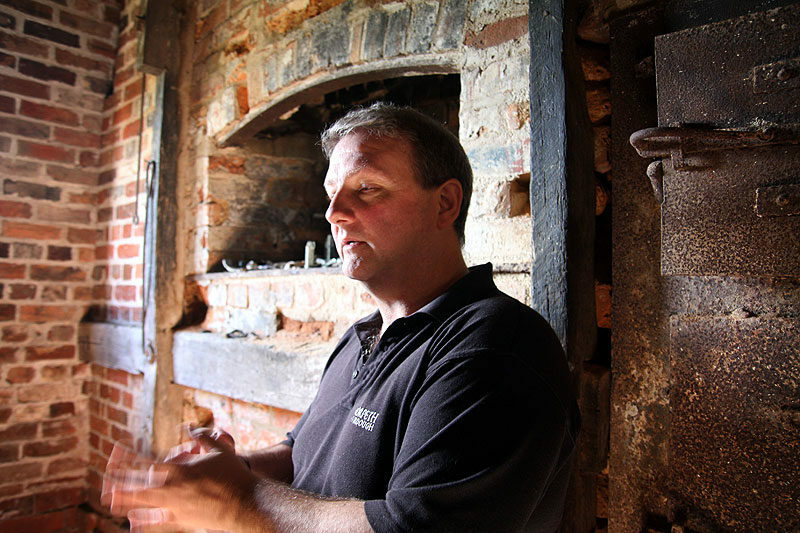 Stephen Arnott, great, great, great grandson of Arnott biscuits founder William Arnott, showed us the historic oven in the cellar, which, although rebuilt three times, is said to be the oldest bread-baking oven in the Southern Hemisphere. Stephen took the time to explain the family history in captivating detail. They bake about 8000 loaves of ten varieties of sourdough a week, then sell them not only in and around Morpeth but all over NSW. The most interesting part is that Stephen and Allison pretty much stumbled into the baking trade after buying the property back into the family in 2001 – then re-establishing the bakery almost on a whim, drawing on Allison’s expertise in food microbiology. After a degustation lunch on the balcony with views over the town, it was off to Camyr Allyn Wines – about 40 minutes away from Barrington Tops and elevated above the outskirts of the village of East Gresford. This family-run vineyard offers stunning views over the area, and owners Judy and John Evers have realised their dream in establishing their own estate-grown wines, producing excellent Verdelho, Shiraz and Merlot grapes. We soon found that it’s no business for people who want to relax and enjoy retirement. “To be successful with this size you really have to do most of this yourself, and that even goes to cellar doors sales . 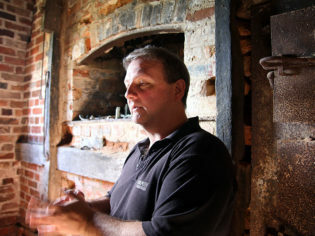 . . which is fun and not really a job,” said John while pouring a glass of his famous Ruins Liqueur Verdelho. “We’re doing at present 2500 cases per year,” he continued. Strolling around John and Judy’s property and jumping over cattle grids to get to the freshly pruned vines, I felt right at home – a sentiment that readily repeated itself over the course of my visit. Last and favourite stop: Bunna Bunoo Olives. A family-managed olive grove on the Paterson River. The Iacono family, much like the Arnotts, stumbled across the olive growing business when they bought the property in 1997 and found 4000 trees already established on it. Today Irma, Chris and Greg Iacono grow five varieties of Italian olives. The oil is cold pressed locally and processed onsite in the Iacono workshop. “We were going to put an olive press in, but decided against it. An olive press only works for about two weeks a year, then it just sits there; You can’t make coffee with it, you can’t make ice cream, it doesn’t do grapes. It does olives and olives only,” Chris passionately explained to us. While having a look around the workshop, Irma had prepared a lemonade concoction of fresh lemons, limes, mint leaves and some other secret ingredients that reminded me of my very own Nanna’s lemonade. Upon trying to retrieve the secret recipe from Chris’ tightly sealed lips, he told me: “It’s nothing special; it’s pretty simple, darling.” I knew not to press. There’s plenty to do around the olive grove. They have a great dog, some horses and cattle, as well as some interesting machinery to look at. The variety of produce in their little shop is nothing but a delight and Chris and Greg’s honest and kind demeanour made me not want to leave. Upon my return to Morpeth, Joel and I were excited to enjoy dinner at one of Maitland’s fine-dining venues, 305 Restaurant and Cafe on High Street. Even though it looks inconspicuous from the outside, the inside welcomes you with its sleek and modern design. This truly was food to inspire all senses. We started with leek soup and homemade bread rolls; tomato, onion and basil bruschetta on sourdough; warm olives; cacciatore and fetta, then followed on to the mains, which were as much of a culinary delight as they were a feast for the eye. Following frenched rack of lamb for Joel and meltingly tender Atlantic salmon for me, we were truly satisfied when head chef Daniel served an apple sorbet palate cleanser that simply blew our minds. Daniel’s kitchen is inspired by his Italian and French training and his partner Christine ensures perfect ambience and a seamless dining experience. Truly a place you shouldn’t miss when you’re in the Hunter Valley. With the sun low on the horizon and the rolling, vineyard-covered hills surrounding us, bathed in the faint light of the last few remaining autumn sunrays, we drove past picturesque little villages with chimneys blowing smoke into the brisk air. To the left hung a marvellous full moon, looking like a golden pumpkin reflected on the many water ponds that had formed over the past few weeks. It had been an incredible weekend in one of the Hunter’s less well-known areas – I can’t recommend highly enough that you go and have a look for yourself. Where // The Maitland region is about 160km north of Sydney on the Pacific Highway. Bronte Guesthouse: www.thebronte.com.au, (02) 4934 6080. The Commercial Hotel: (02) 4934 5316. The Historic Arnott Bakehouse: www.arnottsbakehouse.com.au, (02) 4934 4148. Camyr Allyn Wines: www.camyrallynwines.com.au, (02) 4938 9576. Bunna Banoo Olives: www.bunnabunooolives.com.au, (02) 9416 3698. Anna, your personal and emotive reflection of this trip has inspired me to follow your footsteps. I enjoy short get-aways with my partner and like to steer away from the commercialised dimensions of the Hunter. I sincerely thank you for a grand idea!